Pieces of Eight is a masterpiece. If you want to know why rowing is one of Britain’s ‘Formula One’ Olympic sports you should read this book. Over the years of my involvement in rowing, I have heard what might best be characterised as towpath stories of the Janousek eights of '74 and '76, told of course in the manner of legend being passed from one generation to the next, but those stories were always tantalisingly brief, and lacked the colour and tapestry necessary to bring to life the epic journey, achievements and legacy of those crews, for those of us who were only children - and hadn't even found the sport - at the time. With your wonderful memoir now in print, the history has finally been written for all of us who love rowing to read and marvel at. It was an absolutely compelling read, so I felt I had to write to express my appreciation for such a great book. PIECES of EIGHT Bob Janousek took British rowing by the scruff of the neck when he arrived in London from Prague in 1969 by challenging the world at the Montreal Olympic Games in 1976. His hand-picked crews restored Britain to the Olympic and World medal podium, reversing catastrophic decline after the 1948 Olympic Games. 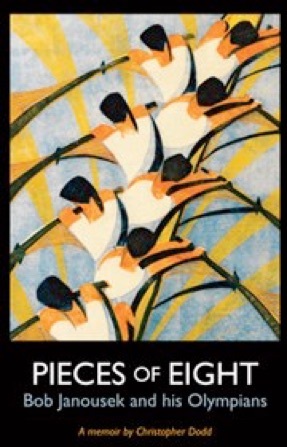 Pieces of Eight is the story of a revolution told by the oarsmen and the coach who made it happen. Pieces of Eight is full of drama. The world of top-class 1970s rowing is vividly brought to life.